BATON ROUGE — Classes have begun at the newly-renovated and greatly-expanded Baton Rouge Magnet High School at 2825 Government St.
A $58 million construction project left the main building, built in 1928, intact, but added other buildings on the east, west, and north of that original structure. Baton Rouge High alumni pushed hard to keep and renovate the historic campus, rather than tear it down. Altogether, the new school has 336,000 square feet of usable space and can accommodate 1,500 students, according to Nanette McCann, principal at Baton Rouge Magnet High School. Current enrollment at the school is 1,360 students. BRMHS is considered one of the top magnet schools in the South. A tour of the school Monday showed state-of-the-art classrooms, a new gymnasium, cafeteria, library, courtyard, and outdoor track. The old auditorium was kept and renovated. In many ways, it is the heart of the campus. The campus combines two quite different styles of architecture — the old traditional main building and modernistic new construction. The architects blended the two together with a seamless transition. Architects for the project were Chenevert Architects and Remson Haley Herin Architects. 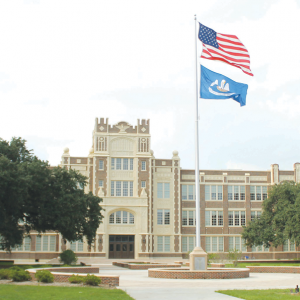 The general contractor was MAPP Group, Inc.
For the past two years, the student body and faculty of Baton Rouge Magnet High School have been housed at Robert E. Lee High on Lee Drive. That deteriorating facility is in stark contrast to the new high school, and faculty and students were relieved and joyful to move to the new campus. Around the school, students are all-smiles, apparently basking in their good fortune to be the first occupants of a new, highly-advanced high school. During the tour of the school, principal McCann, who has been chosen for both State and National Principal of the Year, showed off new science labs, computer labs, choir room, band room, art classrooms, and two black box theatres. Virtually all of BRMHS students are advanced but the school also offers even more advanced programs of individualized instruction for those who are especially talented in academics or fields such as voice, piano, or art. One student, Anni Zhang, said the school offers a great learning environment. Miss Zhang, who was born in China, has a 4.8 average and ranks No. 2 in her class.